We had the exciting opportunity to do a mini-Christmas with my in-laws last week and I was blown away by the awesome gifts I received! Everything was something I loved and I was pleasantly surprised at how well people picked for me. Here are some great gift ideas, all affordable, beautiful, and one size fits all! One thing I can't stand is my non-photogenic nature (have you ever seen the Friend's episode about Chandler and trying to take engagement pics? Yeah, that's me) but I do love piecing together a great outfit with super cheap items and marrying fashion with functionality. Here are two of my go-to outfits lately, one that represents some awesome deals and one that works well for my everyday life while still looking good. As far as keeping things inexpensive goes, the general idea I follow is finding a look I like and recreating it. It starts a part at a time while following sales and in some cases, being very very patient. The second most important criteria for me is comfort level. I have to be able to get dressed in the morning and keep in on through the days activities. While it would be amazing to spend every day in gym clothes at the park with my kids, I find putting myself together creates a snowball effect of confidence in myself, my abilities as a mom, and also motivates me to work out. Win win win! My secret weapon of this outfit is the wedge oxfords. Wedges are much more comfortable but still give height and length. What tricks or tips do you follow for a great comfortable outfit while keeping the price low? I put together a very similar outfit at a much more affordable price point! I am loving how great this would look on a busy winter day, either at parties or even simply running errands. I am really excited about today's Easy Wardrobe Update because it is so much fun to look at! Having some sparkle to an outfit, especially in the wintertime and holiday seasons adds an extra bit of energy and excitement to your look. There are several great items at amazing prices that will add that much more appeal and attention to any outfit. Keep checking back for more fun fashion. Today's "work it" outfit comes from Banana Republic, a store that I have a love/hate relationship with. Doesn't it feel like they are hit or miss every season? Anyways, this season is a hit for me, especially with great outfits that are classic but still fresh in appeal. I am loving the look of skinny jeans, plus great heeled oxfords, and the red/pink combo I normally don't like looks fun and peppy all put together. Here is the same look for a lot less! I have been so glad to share this blog with you, and I would love to keep the excitement going. 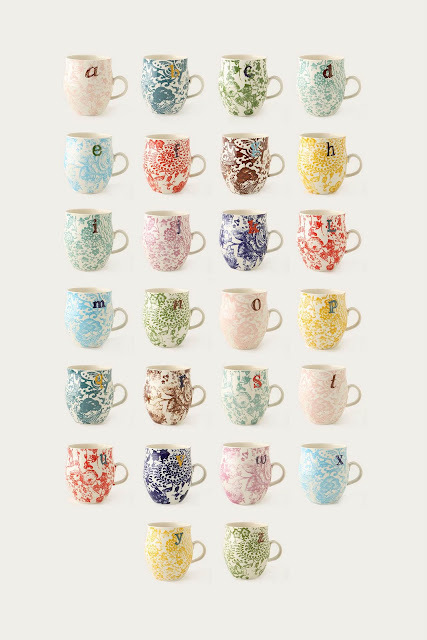 The winner will receive a homegrown mug from Anthropologie in a monogrammed letter of their choice. Giveaway ends sunday night and will be announced Monday, November 21st!! Entries are numbered through the comments. You are allowed up to three entries. You get an entry by blogging about WMMW, writing about it on facebook, or adding the button to your own blog. Let me know what you like seeing on the blog and what you would like to see more of! Instead of the typical white button down shirt, try these instead. Made with silk or silk accents, they add a level of sophistication and can dress up a pair of great jeans. Twice a year my life is brightened with Nordstrom Half Yearly sale! It all began five years ago when I found a shirt for literally $0.01! I haven't been able to find such a great steal since then but I love to look and see all the fabulous sale items. Here are some of my favorites from this year's sale. While some items may be sold out in certain sizes online, they are definitely worth looking into at your local store.